Venice is a city rich of history and tradition and, even if is not so big, there are a lot of things to do and a lot of attractions to see in 3 days. If you have only few time available you should organize it in the best way to do what you like, without forgetting that there are “mandatory steps” that in our opinion are worth doing (and seeing) to make your holiday unforgettable. For this reason we have prepared for you an itinerary of three days in Venice, that guides you to te discover of Serenissima and of its most hidden and peculiar parts (follow our suggestions). Do you have enough time available in three days? When you arrive at Piazzale Roma (taxi, car or bus) or in the train station Venice Santa Lucia you will immediatly find in the city center of Venice, because the city is an open-air museum. So just the fact that you have arrived, you will already be immersed in its history. We think that rhee days are enough to visit Venice and you will have more time to discover also its islands. Follow our advices about the itinerary that we have prepared for your holiday in Venice, a unique chance to spend in the best way the time available (you will be satisfied). How to spend three days in Venice? If you have a lot of time available you can plan your days for every three days in Venice, trying to visit all the areas of Venice (there are 6 districts). We would like to design an ad-hoc itinerary, based on our experience, to allow you to visit Venice (and its islands), leaving you still a certain freedom but at the same time advising you about what to do and see in Venice in three days. Your itinerary starts at the moment of your arrive by train (Venice Santa Lucia Train Station) or by car (or bus at Piazzale Roma), where you can immediatly have a view of the city if you cross Ponte della Costituzione (or Calatrava, one of the four bridges that cross Grand Canal) and take some nice picture. You have to know that Venice was built on the water and is crossed by canals that are accessible with the ferry boats (on the site ACTV you can buy tickets for 1, 2 or 3 days) or with the more expensive water taxi. Alternatively you can walk, but if you don’t want to be tired in the evening, the editorial staff of Venezia Help suggests you to alternate the two possibilities that you have available (visiting the city bothwalking and with ferry boat). Once you arrive to stretch your legs you could walk towards Piazza San Marco crossing Ponte degli Scalzi (in front of the train station). Its name derives from the the fact that the bridge faces the Church Santa Maria di Nazareth, where the mass was officiated for centuries by the order of Carmelitani Scalzi and this bridge today stands out on the Grand Canal (one of the 4 that cross it of a total of 435) and permit the direct access to the heart of the city. Following the indications that you will find on the buildings, you should continue in the direction of San Marco / Rialto until you will arrive at the oldest and most beautiful bridge of Venice (also this one cross the Grand Canal), Rialto Bridge: make your way among the tourists and take some nice “souvenir photos” with a wonderful view of the lagoon (from its summit). The area surrounding the bridge offers a lot of alternatives: shopping, bacari (typical venetian bar) and fish market (only in the morning). In a few minutes on foot you will arrive in St. Mark’s Square, but before you have to cross bridge of Sighs. The legend tells that if two lovers pass with gondola under the bridge at sunset, their love will be eternal. But the sights was of the prisoners that crossed the bridge knowing that it was the last time that they saw Venice. After crossing the bridge you could have a short visit of Palace of the Prisons to see where the prisonsers were closed and the way that traveled. Close tho Palace of Prisons, it deserves also a visit Doge’s Palace (you should book your ticket online on the official website to save time) and know everything about timetables, closing days and other informations like the accessibility. On the website of the palace you can also find the ticket for the visit “secret itineraries” and if you don’t want to miss to much time queuing you should buy the skip the queue ticket for Doge’s Palace! St. Mark’s Basilica represent the most important monument of Venice and is the symbol of the freatness of Serenissima. For the high number of tourists that are present every day in this place we suggest you to buy the skip the queue ticket that allows you to make a tour with a skilled guide not only of the Basilica San Marco but also of Doge’s Palace. Torre dell’Orologio, that is also named Torre dei Mori, is one of the most famous architectural symbols of Venice: the entrance to the neuralgic commercial street of the city, the ancient Merceria, dominates like a triumphal arch. There are the locations of the political and religious power, the places of the representation and those of the economy. The Tower, with its precious machine, is visitable only for small groups of people and need reservation. The island of San Giorgio Maggiore it is only 5 minutes far by San Marco and you can easily reach it with the ferry boat (line number 2). It is not a really touristic place because there are not bar and restaurants, but you have to visit it if you want a unique view of Venice, if you love Palladio or if you want to live the quiet of monastic life. Only in the 1951 the island recovered its cultural importance thanks to Foundation Giorgio Cini, established by count Vittorio Cini; this private institution restored the island in the monumental part and the cultural events linked with the venetian civilization or current events. The area is not very cheap, especially the bar around the square. So, you have to follow our suggestions to save money or you have to move away a bit from San Marco to find some tavern where find something to eat. You could try in Calle of Albanesi, a few tens of meters from Piazza San Marco, the restaurant alla Basilica where the proposed menu is really wide. You can choose between different dishes of meat or fish, all of them are cooked at the moment with fresh products. What attracts travelers in this restaurant is the fixed price menu: you can choose between a first course, a second course and a side dish, among those proposed, at an advantageous price. 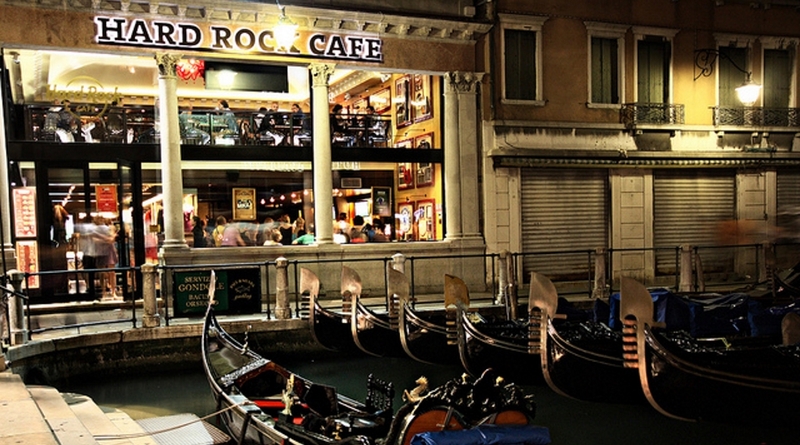 Of course Venice is expensive, but if you want to save some money, with a less tipical dish but glamour, go to Hard Rock Cafè. Our advice in this case is to book a ticket for the priority seats beacause there is always a lot of queue in every Hard Rock in Europe(this is the smallest) and Venice is also full of tourists. So, is better to book or you have to be very patient in you find queue. The best way to reach and immerse yourself in the atmosphere of San Polo is on foot, or it can be reached also with gondole and ferry boats, mean of transport on the water of the public service ACTV. The historical area of San Polo Fields is very close to Rialto, where along the way you can find bacari (typical venetian bar) where eat some cicheti (finger food) and a glass of wine (you can have a little break). Campo San Polo is in the smallest sestiere, but is the biggest field of Venice, infact in the past was intended for crops and pastures. Here are often organize shows, stands and special events. The historical walls of San Polo Fields are proofs of a very peculiar part of the history of the city, that is also called “Libertine Venice”, with characters like Casanova. Scuola Grande San Rocco was the location of a confraternity of venetian rich people dedicated to charity and takes the name from the body of San Rocco, that is conserved here . In 1564 the Confraternity entrusted Tintoretto the task of decorate the School. He put all his skill in painting the Hall of Albergo of School of San Rocco: he succeeded, because this cycle of artworks is considered the Sistine Chapel of Venice. You can reach it on foot or by vaporetto (stop San Tomà line 2). Palazzo Corner Mocenigo, a very nice museum embedded in a noble palace close to Rialto in an area that you can reach on foot from the Train Station or with Ferry Boat (S. Stae stop). It has been created a route that, through beautiful halls with original furniture, tells the story of the venetian costume and style of the Eighteenth Century. It is possible to visit the hall where is explained the creation of the fragrances and you can also smell the material with which were created. We suggest this place to everyone wants to visit something unusual in a quiet area of the city. The options that we propose are essentially two: an aperitif in some bacaro (venetian bar) and dinner in some tavern or a long aperitif that only Venice can offers you. We suggest you to read our post where to eat without spending too much, so you can select the best restaurant in the area that you have chosen. We have decided to propose you the night tour and not the day tour (which you can do anyway if you want) because in our opinion seeing Venice completely illuminated in the night is a very evocative experience. With the line 2 you can travel the main canals in a short time (60 minutes) and see by a different perspective the most important buildings. Moreover, during the night Venice is illuminated by lights and colors that create a wonderful atmosphere (take some nice picture). Breakfast is a very important momenti of the day and more and more in Venice because you will go up and down through the bridges every day (unless you take the ferry boat all the time). So through the alternatives of where having breakfast in Venice (for who doesn’t want waste time), are to try the typical pastry shops scattered throughout the city (or the classic bar). For classic Venice lovers that have money to spend, we suggest to sit at the tables of one of the historical cafè of San Marco, like Cafè Florian, just like the most important persons of the italian and foreign literature and art did in the past. The islands can be comfortably visited through the links of the ferry boats ACTV, it is enough to go to the website and find the map with the various lines and timetables to understand how to reach a particular island. But if you want to visit more than one island we suggest you to take a look to a tour through the most famous and peculiar islands that could be a mandatory step of who visits Venice. An opportunity not to let you escape that will allow you to visit as well as Murano with its artistic glass worked (you can find them in Venice but the prices are not realy cheap), even the picturesque Burano, famous for lace. In addition, included in the price of the ticket, there is a visit to the island of Torcello, home of numerous Byzantine churches (in the past was more populated and more powerful than Venice). When you come back by the tour of the islands, stop in San Marco and start walking to Dorsoduro district or, if you are tired afeter the tour, take a ferry boat and go to the stop of Accademia. Before going into sestiere, you have to pass the Ponte dell’Accademia, which had to be only a temporary bridge. Indeed, after almost 80 years, thanks to expensive renovations its wooden structure still holds and is well blended with the landscape: when you arrive in the highest point, remember to rotate yourself 360° to see all the attractions around. After the bridge you will find Gallerie dell’Accademia, and ancient and unique source that illustrates the history of venetian painting from the fourteenth century to the eighteenth century. In Gallerie is can also possible admire amazing masterpieces, like: San Giorgio of Mantegna, San Girolamo of Piero della Francesca, Vergine of Cosmè Tura, Tempesta of Giorgione, Pietà of Tiziano and artworks of Tintoretto and Veronese. In addition to Galleries you can also visit Ca’ Rezzonico (home of the eighteenth century museum) a wonderful palace overlooking the Grand Canal that preserves wonderful artworks of this period. Inside you can find wonderful halls with a lot of paintings, frescos on the floor and ancient furnitures (ferry boat stop Ca’ Rezzonico Line 2). If you visit the official website you will find all the informations that you need (prices, timetables, accessibility etc). Sestiere Dorsoduro unifies tourists, students and venetian people and is the best place for a break. In the central square, Campo Santa Margherita, every bar has the name of a color; there is blue bar, red one, orange or black where you can stop to recover yourself after a tour of the city of the lagoon ant you can try the famous finger foods in the venetian bacari (typical bar of Venice). There are also a lot of artistic shops and good restaurants, however Academy Bridge is the best link to reach the touristic areas of the city. When you arrive in the island you can have an aperitif (and eat something) in one of the bar along the shore of the Canal: you could try a giaduiotto or an ice cream, or a spritz with some cicheti. The most suggestive view of Venice is by the panoramic terraces of Hilton Molino Stucky Venice, where the Skyline Rooftop Bar of the hotel is ready to receive the guests and the external clients. By the two terraces of Skyline Rooftop Bar the view is amazing. Terrace “Marghera” is the place where admire the sunset, while the “Venice” one offers a fascinating view of the city , thanks to his upper position, one of the highest of the City. Magic during the day, mysterious after the sunset, it is Venice by night! If you usually have an image of Venice with a mass of tourists that walks slowly in single line to see the most important attractions of the city, you will be surprised by what Venice can be offers when the sun goes down. You will feel like in another dimension. Young people, students and a lot of venetian people prefers the area of Campo Santa Margherita If you are loking for the real nightlife, this is the right place. Here you will find bar, pub, restaurants and wine bar, where have fun with friends (or, why not, have a romantic date). f you love beer you can’t miss the pub Santo Bevitore (the Holy Drinker Pub), close to the train station, where beers are of great quality and there is often also live music. If you love jazz music, don’t miss Venice Jazz Club, close to Campo Santa Margherita, in Dorsoduro. Live concerts, cocktails and good wine will be with you for all the night in this peculiar pub. For the more romantic people, lose yourself among the streets and stop on the shores of the canals, perhaps drinking a glass of wine, with the noise of the water and the silence that you breathe in the less frequented areas (Castello and Cannaregio). You can not say that you were in Venice if you do not have this unique experience that will accompany you to discover Venice from the water, giving you views of the city that you can not see on foot or by boat. The editorial staff of Venezia Help suggests you to read the post a tour with gondola in Venice, that will take you to discover the different itineraries that the city offers you. For now, we prose you one for the most curious people, that will carries you in a tour through canals that are unknown and not very frequented. Sestiere castello borders with Cannaregio in the northern part and in the space between Fondamenta Nove and Campo Santa Marina, while in the southern area borders with sestiere San Marco in the area between San Lio Church and the famous San Marco Square. Convent of Saints Giovanni and Paolo, rebuilt between 1660 and 1675, includes two cloisters and a courtyard. Today it houses the Civil Hospital of Venice..
Convent of San Francesco della Vigna, dates back to the mid-fifteenth century and nowadays is the home of the Institute of Ecumenical Sciences. Organ concerts and Gregorian chants are organized during the summer.. Finally, in the eastern part we find the Public Gardens that are the biggest green area of the city and were created in 1807 thanks to a Napoleonic administrative order. In the same time was realized Garibaldi Street, that now is full of life and with a lot of shops, bar and restaurants. Moreover, every morning a fruit, vegetable and fish market is set up. An attraction that you must see is Arsenale of Venice that is an complex shipyards and factories that constitutes a very big part of the venetian island in the eastern part. It was the heart of the venetian naval industry since the twelfth century and represent the best period of the life of Serenissima. A part of this big complex is the home of expositions of modern art of Biennale of Venice (more or less a quarter), which we suggest to visit both to the expert and tourists because it could be very interesting (for further informations visit the official website). Sestiere Castello borders with the district of Cannaregio, that is out of the most popular itineraries of the tourists, and you can try Osteria Boccadoro in Campo Widman. After a day of walking through calli and fields, discovering the treasures of the wonderful Venice the best thing is reach this real protected oasis. Here the lovers of fresh fish , will be satisfied. Through starters of fish, raw or marinated, we suggest you to taste seabass. Generous and structured is the wine list, but for those who do not want to risk of making mistakes, do not hesitate to ask for advice. Alternatively, in this area you can find (especially in the area of University Ca’ Foscari) some typical tavern and restaurants with fixed-price menu that with 10-12 euros will make you taste also typical dishes of venetian traidition (much depends on what they serve, the menu changes every day). Church Carmelitani Scalzi, originally decorated by Tiziano, it was destroyed by a bomb during the war. What remains of the fresco is visible today at Gallerie dell’Accademia. In the area of Cannaregio you can visit Jewish Ghetto (the oldest in Europe), out of the touristic chaos and immersed in a mystic atmosphere (after Guglie bridge). In the Ghetto there are 5 synagogues and 1 museum or you can try the candies, especially biscuits, handmade and made following the ancient recipies, like “recie di Aman” or “ears of Aman” (bundles made of pastry filled with jam, almonds, poppy seeds or chocolate) that are candies of the Purim Fest. If you have enough time and your departure is planned after the sunset, one of the most evocative places where you can admire it is Fondamenta Cannaregio. From this point it is possible to see the sunset on the Lagoon watching the dry land. You can sit on the ground and waiting the moment when the sun goes down and for the luckiest ones (when the sky is limpid) it is possible to see also the Dolomites on the horizon. Only a 10 minutes’ walk away from St. Mark’s Square, the hotel includes a support service for the booking of field trips and tickets, the staff is polyglot and the hotel is provided with a nice garden. A welcome cocktail is served every day and the wi-fi is available in the whole building. The staff is very kind and always available. The hotel, provided with a restaurant, pub or lounge and a panoramic terrace, it is only 2km away from St. Mark’s Square. The staff is polyglot and it will support you in the booking of field trips and tickets. It has been recently restored. Located in the same area of famous branded shops, this hotel is near to St. Mark’s Square, to the Doge’s Palace, to Rialto Bridge and to the Bridge of Sighs. A hotel made from XVIIIth century buildings that owns a private docking, a terrace and a library. The “Le Maschere” restaurant is modern and proposes simple local dishes and cocktails. This family hotel includes a gym, support for the booking of field trips and tickets, polyglot staff and a restaurant. The Mestre-Venice train station is only a 15 minutes’ walk away. It is easily reachable from the highway as well. Built in 1964, it also owns a meeting room and spaces for conferences. So, do you follow our itinerary of three days in Venice? F so, leave us a comment (even if you follow only a part of it) and tell us you experience! We leave you a video that give you a panoramic view of the city and honors it. This video is part of the 10 best videos of Venice.